Dense shrub with bright green foliage. 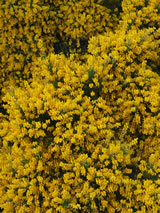 Large clusters of golden-yellow flowers appear on the branch tips throughtour spring and some again in autumn. Trim well after flowering. Very hardy. Prefers a sunny site. Grows in exposed or coastal sites. / Grows in sun or semi-shade / Will tolerate very hard frosts.